ST. GEORGE – The community continues to show an outpouring of support for 16-year-old Britton Shipp, raising over $20,000 for the teen and his family in just one day. Shipp, a Snow Canyon High School football player, lies in a coma at Dixie Regional Medical Center in St. George after sustaining injuries from an ATV accident Saturday while on a day activity date for the Sadie Hawkins dance. Shipp was participating in the group activity prior to the Snow Canyon High School dance when he and his date, a 15-year-old Snow Canyon student, crashed while riding in a Polaris RZR side-by-side all-terrain vehicle in Pine Valley. Shipp was taken by Life Flight to Dixie Regional Medical Center in critical condition with a severe skull fracture. His date was also taken to Dixie Regional, by ambulance, and has since reportedly been released from the hospital. he has swelling on his brain stem, and his brain is kind of sagging down, if it were to get any lower, it could be very bad, but it is in a managable spot right now, and they are doing everything they can to control it. His thalmus, which is more in the middle, is experiencing some bleeding. And he has a stroke spot, but the doctors said if you were to have a stoke, that is were you would want it to be, it affects motor skills. But britton seems to be moving and responding just fine to all of their tests. The tubes tubes they put in seem to be doing thier jobs, delivering oxygen and blood flow to the brain. The tissue spots that were discolored are no longer that way, they look good! The fracture of his ear canal on his right side, seems to be healing itself. He has been responding very well with all 4 extremities to painful stimuli. more details to come!! By Tuesday afternoon, a GoFundMe account set up for the Shipp family by a family friend had already received an astonishing $21,366 in donations from 211 people. Believe4Britton wristbands are also in the works and will be sold beginning Wednesday afternoon at Swig, located at 989 E. Tabernacle in St. George, to raise money for the Shipp family. 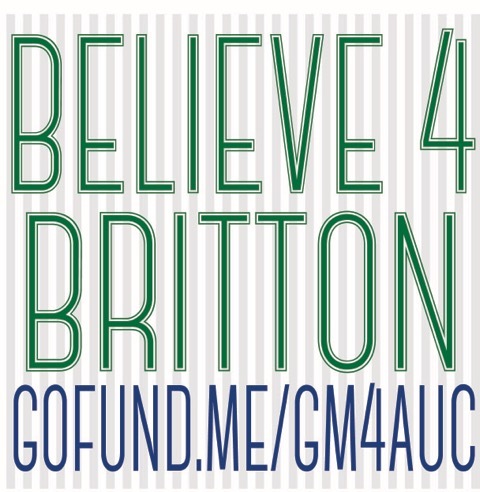 Sports personality Devin Dixon is asking for the community’s help in posting the Believe 4 Britton logo to help show support to the Shipp family and raise awareness for the cause. “Please post (the logo) on your websites… facebook… social media…print it…. post it anywhere you can,” Dixon said in an email. Please continue to send thoughts and prayers to Britton & Jesse & Sommer Shipp and their family, during this Tragic time and keep praying for a Miracle. Rebecca Decastro will be holding a 45 minute Spin-A-Thon at 2 p.m. Saturday at the Desert Palms Fitness Club to benefit the Shipp family. The cost is $30 to reserve a bike for the spin session and reservations can be made by calling Decastro at 435-229-3477. The Nashville Tribute Band has also volunteered to help in the fundraising efforts. The band will be performing a free concert at 7 p.m. Thursday at the Bloomington Hills Stake Center, located at 1130 E. Brigham Rd. They will be taking donations at the door to help cover Britton Shipp’s medical expenses. Prayers for you our friend !!! be there for u thursday !!! Enough for a new RZR and about $20K more than raised for the girl assaulted by three boys in Santa Clara. Where was the outpouring of support for her? Ask for donations for a popular HS football kid and they come pouring in. When the poor need help, they are scoffed at. And all in Jesus’ name. It’s a matter of who’s worthy and who isn’t worthy, or maybe which bishop you bump elbows with. Who the heck is “sports personality Devin Dixon”? Is he some kind of athlete? What “sport” does he play? people need to keep medicaid cause their companies dont provide affordable health insurance. This family has donated so much time to various youth programs and high school events that no one will ever know about! That is why there is so much support , they are loved!! This family is receiving so much support because they are productive members of our community. Britton is an intelligent, well mannered, friendly young man. The overwhelming community reaction is a tribute to both Britton and his parents. Wear Seat belts. Simple concept. He was not neither was passenger. I wish all the best for him and his family but really dumb not to wear seat belts. I am sure it’s a lesson he will never forget. Nor were these responsible kids wearing helmets. There was a news report that they were wearing helmets. If he had not been he’d probably be dead by now. Vile hatred and negativism seems to be the prevailing theme of many posts on this site. I surmise that it is based in the self loathing of the participants. I just moved to this area last year and see sunny dispositions in most of my fellow residents. I only hope that the angry trolls on this site find some happiness in life insead of trying to … on the world. Serious introspection might lead some to mental health care. Depression and borderline personality disorders are treatable. A word of advice. Watch your back. You are right Red Rocker, The comments and negativity about most subjects in the comment section do not reflect the kindness I see in this community. Luckily. All of you people saying what about the girl who was assaulted…. Nobody set up a gofundme account for her. I’m assuming that totally unrelated event to a young boy getting in an ATV accident was written by her sue happy parents. I am not Mormon or religious. I donated. I am not from here either. But I know this family and they have helped lots of people in their lives who needed it. His mother has cut older ladies hair for free for years. She doesn’t even know I know this. Every dollar I donated was because I love this family. Not a thing to do with where they go to church. Every dime from my heart. I did not know those other people. And as far as wearing helmets. They were on a date. They are kids. As dumb as we think it was as adults… They ARE NOT ADULTS! I would have been the same way when I was 16. I don’t know…. Maybe they should have brought their parents on the date. What say you negative jerks. Would you be happy then? No. Because you are miserable. Miserable people and he in a coma is more of a positive influence in this world than you will ever be. I pity you. You are so obsessed with Mormons and money that you sit at a keyboard waiting to be offended. He is a child. You are all sick. Must be sad knowing nobody cares for you like they do this child. Thousands if people care for him. Hopefully your mothers live your foul spirits. nah its just one of those things that happens when people who dont really think anyone deserves help unless its in their own, dare i say , kind… rich help the rich poor help the poor… just the way it is. The negativity involved in it has nothing to do with good deeds.. there are lots of innocent kids out there who are in need of help… with no one there to help them.. and you know poverty effects everyone… but people only seem to open their wallets to some one who they believe has the same social class as them… thats the sickening part about the whole affair. Now how do I go about setting up a gofundme page? Dear Protect the Sheep…please read HERD, THE REST OF THE STORY, UTAH REPUBLICANS AND KOOLAID. I think sometimes it is just best for mean people to not make comments on these types of things. Makes me wish they just shut down comment sections period on things like this. Didn’t santa clara once stage a gun raffle outside a school that a girl attended who committed suicide with a gun? The family of Briton did not go out and ask for these acts of kindness to take place, they have one thing on there mind and I’m sure it is to have there sweet boy better and back home with them. There is a real sadness when one has to express negativity instead of seeing the good, Look for good in each day and you will actually find some happiness in your own lives. Kindness matters and please keep you negative posts to yourself as the family has enough to worry about without you adding to it. Make it a great day. makes you wonder if the parents are against the affordable care act.. or if its one of the i should have went and got insurance before hand….